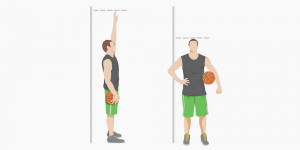 There are many different ways of how to measure your vertical jump, but the most common methodology is the "Sargent Test" where the height of a countermovement jump from a standstill is measured. This test is a great tool to get an idea about the lower-body strength of athletes but one can also measure running vertical jumps, squat jumps or depth jumps to assess different athletic abilities and technical prowess. When I am t﻿﻿raining my ver﻿﻿tical jump, I want to make sure to track my results so I can see if the workouts are actually working. Therefore, I have experimented with a lot of different ways of measuring my vertical jump in the past. In this post I have put together a list of 5 different methods ranging from expensive methods to completely free, DIY alternatives. Modern cameras allow high-frame-rate videos at a very reasonable price. For example the Iphone 6 features 240fps video and the new Sony Cyber Shot DSC-RX100 IV and others make up to 1,000 pictures per second! These allow for an incredible accurate measurement of hang time and vertical jump height. 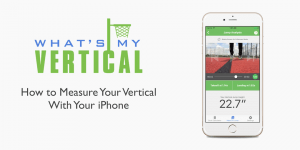 I have created the official ﻿"What's my Vertical" iOS app where you can measure your vertical jump using your iPhone camera! Don't have an iPhone? Check out the browser app where you can load a video of a vertical jump and assess the it by marking the take-off and landing. If you have ever watched the NFL combine you have seen one of these! A vertec is a giant pole with a lot of horizontal vanes attached. These vanes are fixated in a way that they can rotate around the main pole. To measure the vertical jump with an vertec, the athlete first has to push aside as many vanes as possible while standing flat-footed. This way, the standing reach is determined. After that, the vertical jump height is assessed by looking at how many additional vanes the athlete can push aside when jumping. Vertecs are easy to use, deliver fast results and are very accurate when used right. A proper Vertec is not cheap and will cost around $650, which makes it suitable for NFL teams, schools or other institutions, but not affordable if you want to measure your vertical at home. This is the old-school version everybody can do at home. Just stand up against a wall and measure your standing reach, then jump as high as possible, touch the wall and calculate the difference. Jumping against a wall is awkward and may decrease the result. 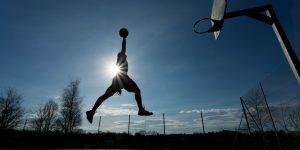 If you use a piece of chalk (or something similar) to mark your vertical jump height, your mark may be inaccurate, thereby fouling up the results. 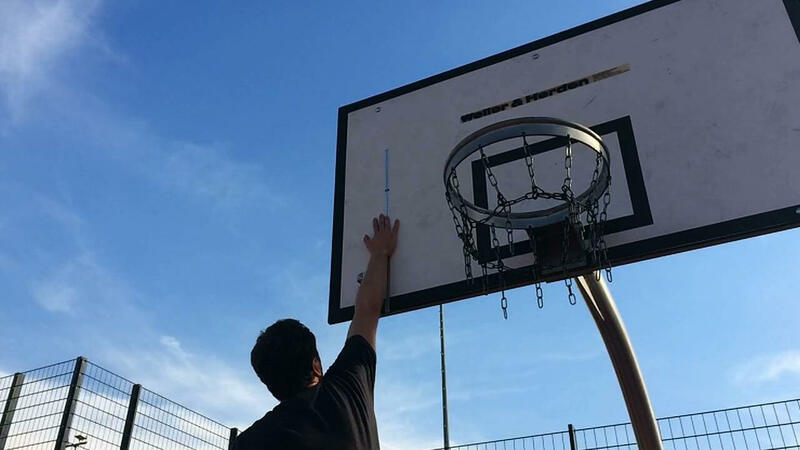 Just ​tape self-adhesive measuring tape against the backboard in a way that is in line with your standing reach. Jump as high as you can and tap the measuring tape on the top of the jump. 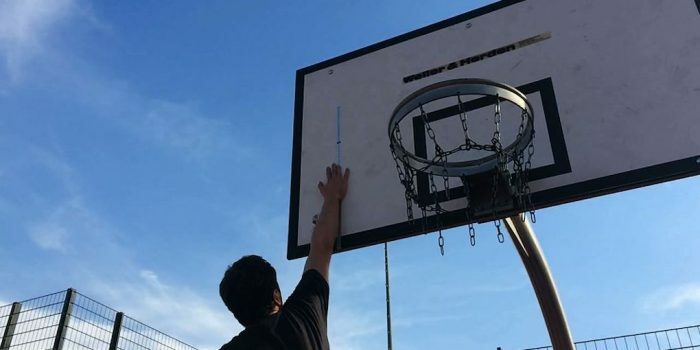 Now you can read your vertical jump height by looking at the ink stains on the measuring tape. You can also do this with regular duct tape and mark different heights, or just take it off the backboard after your jumps and use a ruler. The advantage of this method is that it is free and available to everybody, however it might take a bit of creativity to make it work under different circumstances. Force Plates analysis works by measuring the ground reaction forces generated by athletes running, jumping or doing other athletic movements across them. Force plates allow very detailed analysis of not only vertical jump height, but also rate of force development, acceleration of movements, distribution of power among both feet, and many other factors. Force plates used in biomechanics laboratories can easily cost thousands of dollars, but there are also cheaper alternatives like the Just Jump System. The idea behind these systems is they can measure hang time very exactly by looking at the time the force plate fails to record any ground reaction forces. 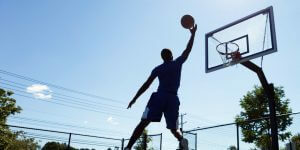 As gravity is (pretty much) constant on earth, this allows a person to calculate vertical jump easily and accurately. The Just Jump system is portable, easy to use and accurate when used correctly. Athletes need to land with extended knees, otherwise they would increase hang time making the results unreliable. These devices are worn by the athlete and work very similar to force plates. Instead of measuring ground reaction forces, however, they measure the acceleration and movement of the athlete himself. The actual calculation works the same way, converting hang time into vertical jump height. The most popular example is the Vert Jump Rate monitor - is a small device you can clip onto your shorts. (It also comes with a belt.) 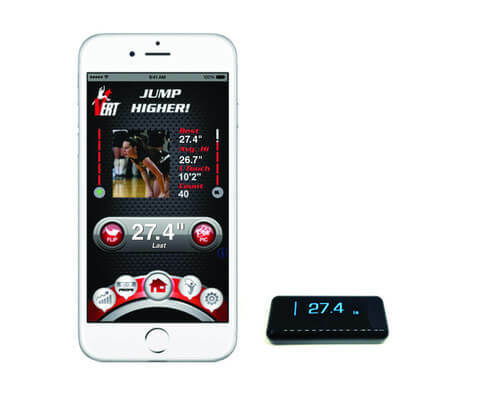 Vertical Jump results are measured in real time and sent to your iPhone app. You could wear the Vert during a game and check out how many times you jumped and how high your jumps were. For more information check out the Vert homepage here. 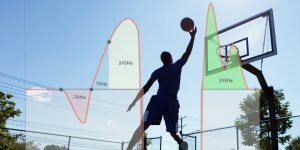 These are my 5 ways to measure your vertical jump ranging from very expensive vertical jump test equipment to more affordable devices like the Vert Jump monitor to free methods everybody can do at home.